(Phys.org)—NASA's Mars rover Curiosity has for the first time used the camera on its arm to take photos at night, illuminated by white lights and ultraviolet lights on the instrument. 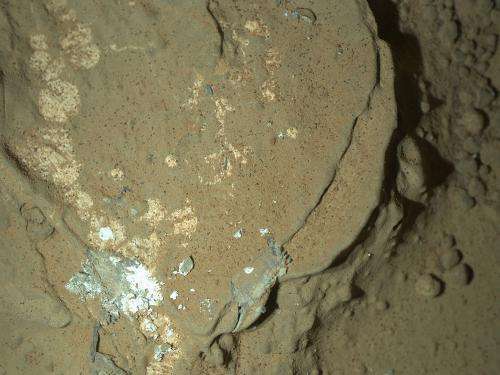 Scientists used the rover's Mars Hand Lens Imager (MAHLI) instrument for a close-up nighttime look at a rock target called "Sayunei," in an area where Curiosity's front-left wheel had scuffed the rock to provide fresh, dust-free materials to examine. The site is near where the rover team plans to begin using Curiosity to drill into a rock in coming weeks. The images of the rock Sayunei and of MAHLI's calibration target were taken on Jan. 22 (PST) and received on Earth Jan. 23. The MAHLI, an adjustable-focus color camera, includes its own LED (light-emitting diode) illumination sources. 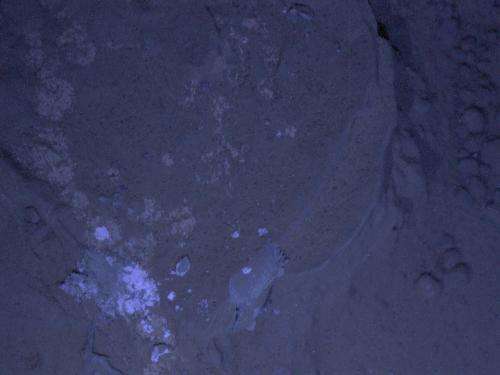 "The purpose of acquiring observations under ultraviolet illumination was to look for fluorescent minerals," said MAHLI Principal Investigator Ken Edgett of Malin Space Science Systems, San Diego. "These data just arrived this morning. The science team is still assessing the observations. 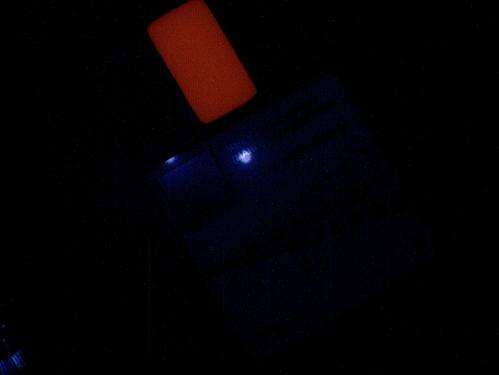 If something looked green, yellow, orange or red under the ultraviolet illumination, that'd be a more clear-cut indicator of fluorescence." NASA's Mars Science Laboratory project is using Curiosity to investigate whether the study area within Gale Crater has offered environmental conditions favorable for microbial life. JPL, a division of the California Institute of Technology in Pasadena, manages the Mars Science Laboratory mission for the NASA Science Mission Directorate, Washington. More information: For more information about the mission, visit www.nasa.gov/msl and mars.jpl.nasa.gov/msl . What? Hasn't that thing got a geologists hammer? I see an image that is so high in quality that it is like looking at the rock with the naked eye, it is awesome. To see it in natural 6k type illumination, and then UV showing what looks like fluorescent material in the rock demonstrates the care and attention that has been put into the programme, and I have to believe as an engineer but not a geologist that this imagery is pretty good. Further I have no doubt that other measurements will be made by Curiosity, and even samples analysed if it is considered appropriate. The whole thing is magic to me!! Well done NASA. Nope. I bet they would love to have one, and a pry bar as well. I'm guessing they didn't give it a hammer due to the shock that would send up the arm, but that's just a guess. The drill is better anyway. lol on the 2012 error. I'll bet that got some laughs around the office at NASA when they saw it. That image is a lot better than your eyes are capable of. Curiosity has awesome cameras. They tried to change them out for even better ones at the last minute, but they couldn't get the testing done in time. They were even going to use one based on James Cameron's 3D movie camera. That would have been absolutely awesome. There's an interesting thing happening now in regard to cameras on science missions. We can now make cheap, light-weight, reliable cameras that use very little electricity and have image quality that far exceedes the scientific needs in cases like this. So when designing a rover like Curiosity, the question has changed from 'what is the best camera' to 'how good do we need it to be'. The reason you don't want a camera with resolution that exceedes your needs is bandwidth. It takes a long time to download a huge file from Mars. Maybe we need to install fiber optic cable from here to Mars. lol. Amazing. Notice that stuff on that rock that looks just like lichens that grow on rocks in cold places right here on earth. Looks like it is growing the same way too. This place may be more earthlike than not only we think, but also more earthlike than many dare to imagine. I wonder what the Mars sky looks like with zero light pollution. Does it have clear nights that offer views of the Milky Way like on Earth?